In this final part of a three-part series (read parts one and two), Anthony Egan SJ concludes his examination of the first five years of Pope Francis’ pontificate. 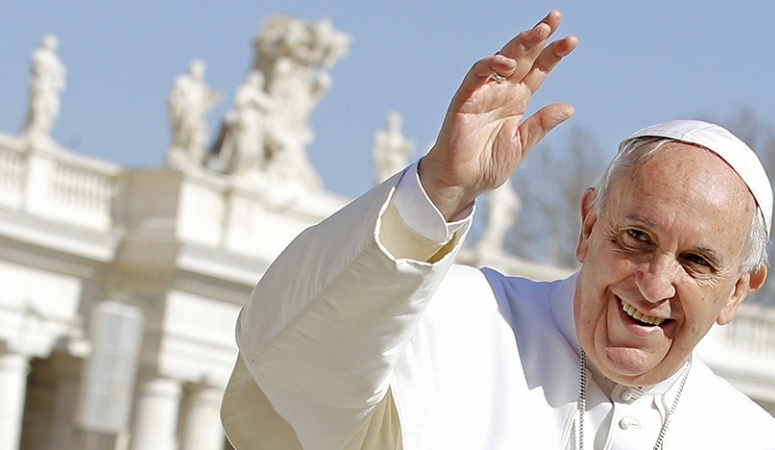 In this third part, he describes the opposition to Pope Francis’ pontificate. Whether from liberals upset with his not reforming ‘enough’ and his understanding of gender issues, or from conservatives upset with his interpretation of Vatican II and his understanding of truth, it appears that those most upset with him are ordained Catholics who do not agree with Pope Francis that change and development are integral to tradition. Anthony Egan SJ examines why this is the case and speculates four possible scenarios for the future of his pontificate and suggests why one scenario may be the most likely. One disturbing feature of the first five years of Francis’ pontificate is Catholic attitudes to him. While among non-Catholics, non-Christians and even non-believers (at least those I’ve met or whose writings on him I’ve read), Francis is generally liked, even loved, Catholics are divided about him. Most lay Catholics like him as a person. But opinions divide as one moves to both left and right of the majority in the centre. While embracing his pastoral approach and concerns for social and ecological justice, liberal Catholic laity feel he has not gone far enough. Together with like-minded theologians (ordained or non-ordained) their biggest objection is his perceived lack of understanding of gender issues. Some say that while his pastoral heart is in the right place (or a better place than predecessors) he has not grasped the complexity of gender based on best available medical, biological, psychological and sociological evidence. They would argue that while he does not have the same kind of knee-jerk rejection or denialism of many in the Vatican, it remains a mental block in his thinking. Similarly, some would say that he’s already conceded too much – accepting Humanae Vitae and the rejection of women priests as infallible teachings, while a strong case based on a close reading of Vatican I’s declaration would deny it. Conversely, Catholics leaning towards varying degrees of conservatism would be more hostile to Francis because they claim he’s undermined doctrinal truth and perhaps the ‘dignity’ of the office. They object to his ‘tampering’ with Church laws on divorce and remarriage, feel he’s introduced moral relativism into the Church by his apparent emphasis on conscience and mercy over law, and by his informality has turned the Petrine office into a joke. His criticism of clericalism (about which more below) has, they say, also attacked the integrity and dignity of the priesthood. Some on the extreme edge go so far as to label Francis’ social action and teaching as ‘communist’ or at very least proof that liberation theology has overthrown Catholic orthodoxy. Now it would be unfair to lump all conservatives into the same basket – some present very sophisticated arguments critiquing Francis (often expressed with deep respect for him and his office), while others (particularly those who enjoy the relative anonymity of the Web) are little more than theological trolls. Leaving the latter aside, the common theological concern seems to be rooted in the perennial problem – truth – and an interpretation of Vatican II. The often unarticulated fear is: if we once did or believed X and now we don’t, then what else is untrue? A reasonable concern, if one holds to a view that all doctrine and moral teaching and church practice is fixed, unchanging and unchangeable. The problem with that is that the history of Catholicism shows that truth develops and grows in the light of new experience. Doctrines, as Newman reminded us in the 19th century, develop – and they give us deeper understanding of faith in the process. Ethics develops too – in the light of new situations, knowledge, insights – and sometimes they change so that their underlying truth and original intentions may grow. Regarding church practices, whether administrative or liturgical, the history of the Church is one of constant flux, often in relation to the world in which faith is lived. Vatican II tried to make this point. The implementation of the reforms moved dramatically back and forward, as happens in any institution in a state of flux. The pontificates of John Paul II and Benedict XVI interpreted and directed the reforms in a certain direction – in effect grafting the Council onto a more top-down law-oriented model of church that had emerged out of Vatican I. For many younger Catholics (including clergy) this has become the only notion of Church they had. Given that this period was marked by less openness to theological dialogue, much of the wider tradition has been lost to this generation. Their concerns when faced with Francis the reformer who draws heavily on the Vatican II he lived through as a seminarian are understandable. But, I believe, mistaken. Moving to clergy and bishops we see a similar split in attitudes to Francis. Once again, from reading and conversations, I sense that there is both a theological and generational split. At the risk of oversimplifying, I think that clergy who either remember Vatican II with affection, or were formed later in more ‘liberal’ seminaries, or who have done extensive studies particularly in church history, are unworried by Francis. Those formed in a more conservative theological environment, who remember the turbulent post-Vatican II period with unease, or who enthusiastically embraced John Paul II’s pontificate, tend to be hostile. Another factor is one’s theology of priesthood. Those who see priesthood as ministry with God’s people – preaching, teaching, ministering the sacraments, together with some degree of social engagement – are I suspect sympathetic to Francis. Those who see priesthood as primarily being ‘a breed apart’, ‘chosen’ or in the worst cases above those they serve find him terrifying. When Francis lambasted priests for clericalism early in his pontificate – perhaps quite harshly, perhaps over-stressing the worst excesses of clericalism, though by no means inaccurately – it put them into a panic, confirming for some that he was ‘undermining’ the Church they ‘knew’ to be true. The same can be said for bishops, but with an added dimension. Most of the bishops and cardinals today were appointed in the previous pontificates. Vatican watchers suggest that the criteria for appointments were simple: holding the theological line on neuralgic issues in the church (accepting Humanae Vitae, no women priests, strict adherence to canon law) and loyalty to the pope in all things. In practice, as I heard a management theorist once remark, the episcopate was shifted from being a board of directors to being regional managers under the CEO. Now not all bishops embraced this. Many I suspect knew clearly from theology their theological role as marked out in church history and affirmed by Vatican II: shepherds and heads of the local church, governing the Church collegially with Peter and never without him. But in practice, so much of church governance was centralised that many lost in practice that sense of collegiality – apart perhaps from tasks delegated to episcopal conferences. The arrival of a pope who practises collegiality, who welcomes frank discussions, and has a more profound concern for subsidiary governance at episcopal conference or diocesan levels, is in short confusing. Some bishops hate it, and a few have even openly expressed it. Some welcome it. The majority I suspect find it challenging – and wonder whether this is the way the Church is going or just a historical hiccup that will pass in a decade or so. Whatever their extent, the fact that a significant number of clergy and bishops are to varying degrees uneasy with or opposed to Francis is a problem. While balanced, reasoned, respectful and sincere dialogue is something Francis clearly accepts, outrightly aggressive opposition, passive obstruction or a decision to sit out the pontificate is unhelpful. When I started this article I warned that assessing the pontificate of Pope Francis would be difficult. Assessing the future is even harder. Style and personality has so far predominated over substantial change in the Church. This is not necessarily a bad thing: Pope Francis has given the Catholic Church a new image that emphasises compassion, justice and mercy, a church that to outsiders seems more open and welcoming (the heart of Francis’ view of evangelization). It is significant that through his personality and style Francis has pushed through a number of key reforms, rooted not in some kind of liberal or radical theological agenda but embracing a wider and longer tradition than we’ve become accustomed to in recent decades, that culminates in an interpretation of Vatican II that values change and development as integral to tradition. Where will it lead? I do not know. If I may wear a political analyst’s cap let me outline a few scenarios. Scenario One: Pope Francis convenes a Council of the Universal Church to resolve pastoral and theological issues collegially. This is a possibility given his previous Synod on Marriage and Family Life. While how it is managed may play a factor, the outcome is unsure. It is possible we’ll see the same lines drawn between liberal and conservative we saw in 2014-2015. At best we might expect a few compromise documents. The problem is that Francis is working with bishops whose way of thinking is heavily influenced by how they had to work before 2013. Unlike Vatican II, the number of theologians (most of whom will probably still be selected from clergy rather than lay scholars) available to advise the bishops are fewer, often more conservative and in many cases part-time scholars working in under-resourced dioceses in the Global South. They are also not joined by a sense of common vision of ressourcement that most Vatican II advisors had. Indeed they may well be deeply divided amongst themselves. My assessment: Much as some Catholics (particularly liberals) want it, another Council will not lead to significant renewal of the Church. At least, not in the directions liberals want. It’s possible, but I think unlikely. Scenario Two: Pope Francis, frustrated by opposition to his pontificate from within, withdraws from significant theological reform. He appoints bishops and cardinals as the need arises, does lots of good ‘public relations’ for the Church through his engagement on global justice matters. In effect he decides to ‘sit out’ his term. He may abdicate when he feels the time is right. My assessment: Highly unlikely. Based on the last five years and his basically hopeful personality, I don’t think Francis could imagine this. (I certainly hope not). Scenario Three: Pope Francis, filled with missionary zeal, decides to go for bust. He institutes a thorough revamp of the Vatican and fires a swathe of bishops whom he perceives are obstructing his mission. He then makes a series of dramatic decisions on matters of doctrine, morals and ministry. My assessment: The radical’s revolutionary dream, but it is a dream. It would provoke a schism perhaps, could even sway Catholic middle roaders to the view that the Pope has ‘lost the plot’ and that deposition is in everyone’s interests. It also goes completely against his deep-seated commitments to collegiality and dialogue. Not a chance. Scenario Four: Pope Francis continues to steadily go about reforming the Vatican administration. As the need arises he appoints bishops and cardinals who emphasise in their ministry pastoral care, social justice and mercy. He further diversifies the make-up of the College of Cardinals, giving a chance that his successor may be from the Global South as well. Without overtly forcing things, he calls a few more Synods modelled on 2014-2015, so that the practice introduced there will, over a few like them, become the ‘traditional’ way they are done. My assessment: This is the more probable scenario. It seems in character with what we’ve seen so far, and fits into Francis’ emphasis on collegiality and of prioritising the pastoral over the dogmatic. And the next pontificate? God alone knows. This was the third feature in a series of three. Read A confounding choice, and the second article on resistance to Pope Francis.